The beach of Pampelonne on foot, the village of Saint-Tropez a few minutes. When interior and exterior are no more than one ... Superb contemporary realization of a renowned architect featuring the most noble materials, playing on transparency and offering absolute comfort, all in elegance and sobriety. Built in 2013 on a beautiful landscaped park of about 4000 m2, it offers 320 m2 very functional: a superb entrance hall with guest toilet, 6 bedrooms (4 on one level of which 2 independent, and 2 in floor) each with dressing room, bathroom or bathroom and toilet, a modern independent kitchen, equipped in Gaggenau, with Corian worktop, opening onto a beautiful terrace, laundry room, an impressive living room through, overlooking the pool side terrace and on a beautiful patio with fountain. Top-of-the-range services: integrated reversible air-conditioning, flat screens in all the rooms and the stay, full-height bay windows, led exterior lighting, Bose sound system and Sonos storage in the living room and bedrooms, alarm center. 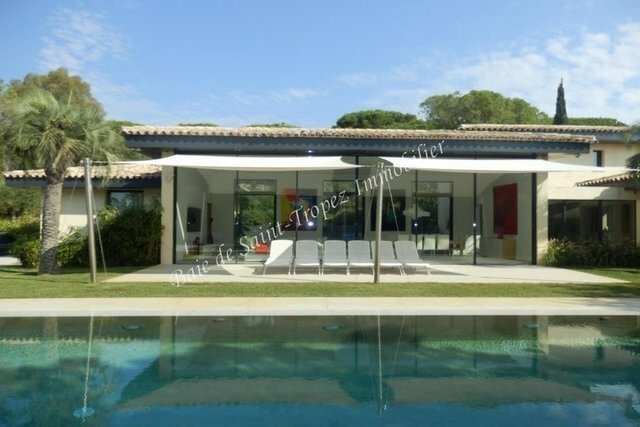 Mirror pool of 14.5 x 4m, helipad, parking spaces, automatic gate ... paradise in Ramatuelle.